What are those “sticks” on Jyn Erso's back? After my wife and I first viewed Rogue One we both walked away and mutually we had one question hanging around. What are these two stick/sword things hanging from Jyn's back? To my recollection, she never uses them in the film so as a prop-piece it seemed like an odd thing to have put on a costume. This made my wife and I speculate that something must have been cut from the film that would have explained their purpose. I am aware that she's wearing this outfit because she and the other rebels have taken out a few Imperial troopers and that they are wearing their uniforms as disguise. She appears to be wearing a gunner's uniform, though I'm not 100% sure that is what the outfit is. I assume this could be part of the uniform. Regardless, I see no example of a gunner wearing these devices, so I'm not sure that she is, in fact, wearing a gunner's outfit. My main problem is that I've never seen these devices before, nor do I recall seeing their use in the movie. They were part of the outfit that Jyn stole from Imperial "Deck Technician" Kent Deezling. You can see him using them to signal landing ships in the clip below. 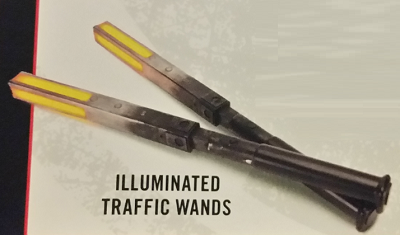 It looks like the wands used by the air marshaller to direct the cargo shuttles when they were landing. You can see the red sections at the tips of the rods that light up and help indicate to the pilot what they need to do and where to move. Similar to what you see in a real life airport. They are from the Aircraft Marshaller they take the suit from. As everyone else mentions they are for guiding the ships to the landing pad. As to answer your question as to the now you see it and now you don't. She took them off. If you recall the scene where they were trying to retrieve the hard drive and the machine jammed, Jyn got the idea of having to blast the glass to go get it manually and you can see her taking off her suit in order to be lighter to make the jump, the sticks are the first things she takes off. I hope that helps. Not the answer you're looking for? Browse other questions tagged star-wars rogue-one object-identification or ask your own question. What are those things in Han's Pocket? Are the Imperial projects listed by Jyn Erso related to anything previously seen? 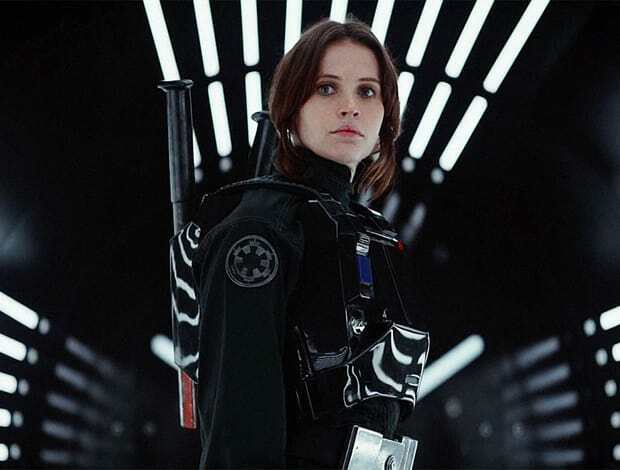 How did the Alliance find out Liana Hallik was Jyn Erso? What were those lines in the opening shot of Rogue One? Why would Jyn say she never had the luxury of political opinions? What is the locket wore by Jyn Erso in Rogue One made of? What are those robots from?